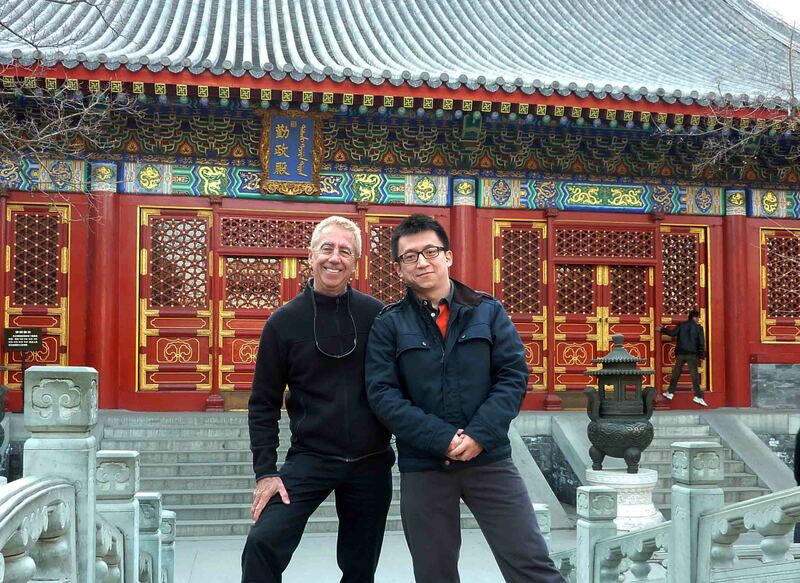 Yesterday Steven Pinkert, his friend Peter Jiang, and Peter’s mother and father, took a drive to the northwest side of Beijing to visit Fragrant Hills Park. Fragrant Hills Park is located in the eastern section of Beijing’s western hills and is about a hour drive from Beijing’s CBD (Central Business District) – depending upon traffic which is frequently a nightmare in Beijing. Fragrant Hills Park was begun in the 12th century by the Jin Dynasty and expanded by subsequent dynasties. There are paths up to the summit with an elevation of about 1800 feet and all the paths are full of cultural relics, beautifully preserved structures and some exquisite foliage. Although the author, Steven Pinkert, has been to Beijing some 40 times he has never see this fantastic park before this weekend in Beijing. As it is an early Spring weekend the park had thousands of visitors – a mixture mostly of Chinese from all over China. Most people visit the park by bus and there is a large bus station adjacent to the park. Parking as in most of Beijing is extremely difficult so any alternative to driving is recommended. Taxis are a possibility but I have no idea how difficult it will be to locate a return taxi. The taxi ride will be quite expensive and locating taxis, particularly outside the Central Business District, can frequently be a serious challenge. During this past week Steven Pinkert typically waited over 30 minutes for a taxi from the hotel and from other locations! After a long and exhilarating walk Steven Pinkert was a bit winded. The elevations of some of the walks are quite steep but there are also many level walks to choose from. The highlights of the park are the beautifully kept brightly painted structures against the spectacular mountain backdrop It was cool and sunny with an atypical Beijing blue sky. As the sun set the temperature dropped rapidly and so we headed to one of my favorite Beijing restaurants, Nala Restaurant. Nala Restaurant, according to Steven Pinkert, is fantastic. There are three Nala Restaurants in Beijing, all owned by the same family for 30 years. The menu is varied seasonally but there is one particular regular item that must not be missed – by anyone visiting Beijing – the sugar fried shrimp. This dish is quite simple. Large shrimp are quickly fried in oil then a final fry in sugar syrup or molasses. This is truly one of the best dishes in all of Beijing and mostly unknown by foreigners. Steven Pinkert takes all his Beijing guests to Nala. There is a Nala Restaurant in Fragrant Hills Park area and another just a block west on the street behind the LG Twin Towers in the central Business District. 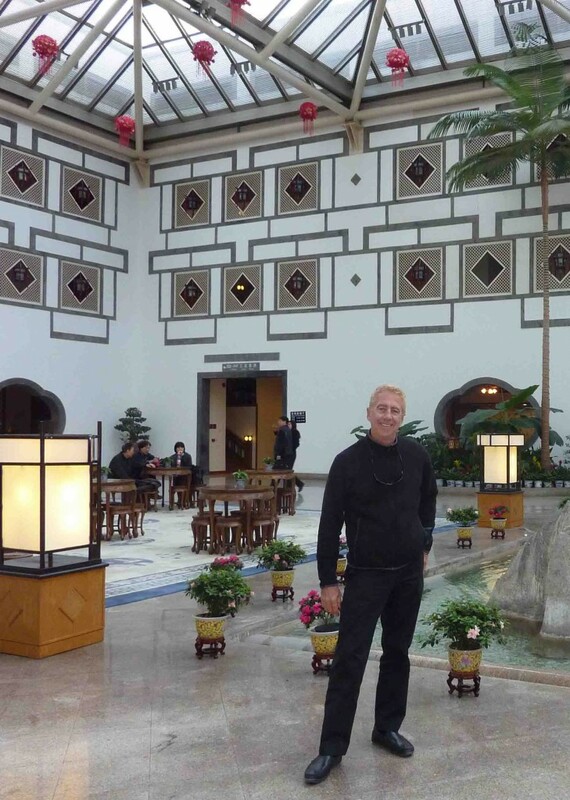 “Beijing’s Fragrant Hills Park and Nala Restaurant are not to be missed” promises Steven Pinkert. This entry was posted in Travel and tagged Steven D Pinkert, Steven Pinkert by Steven Pinkert. Bookmark the permalink. Jamaicans love their own puddings. Several Jamaican puddings for example bread as well as butter pudding were influenced with a colonial time past, while others were a direct result the availability involving ingredients. Puddings within Discovery bay, jamaica won’t be the same because the gelatin-based puddings because consumed far away. Jamaican puddings tend to be heartier like a bread pudding consistency along with a knife is best within slicing the pudding. Discovery bay, jamaica offers different types of puddings and one of the very most popular puddings within Discovery bay, jamaica is a fairly sweet potato pudding. Nice potato within Discovery bay, jamaica is usually a different variety than the special spud (or yam) utilized in ALL OF US dishes. In addition , the term sweet potato sometimes used to make reference to fairly sweet spud in america, is a starchy selection generate within Jamaica and is obtainable in various kinds like yellowish yam and gentle yam. In some Jamaican homes, at home cooks include grated yellowish sweet potato towards the pudding mixture with regard to included consistency as well as for the capturing realtor. Typically, Jamaican house at home cooks roughly grated special spud to make their puddings. Additionally , coconut milk, that was a primary ingredient within the pudding, additionally meant grating the particular dried coconut and also taking out the actual dairy, through a series of adding water as well as wringing your ending coconut whole milk. Many Jamaicans remember the reference to lovely potato pudding since ‘hell a highly regarded, heck hemoroidy a bottom, hallelujah inna di middle. ‘ Through tradition, the pudding was cooked more than a fossil fuel range through placing type of dutch stove (know as dutchie within Jamaica) using a smooth protect more than a grill on the coal filled range. The top from the cover from the nederlander weed was usually full of hot coals, hence the actual pudding baked from each top as well as bottom concurrently. Still with all the creation of ovens, meals processors, food processors and processed coconut milk, house at home cooks now have a much simpler work for making their puddings. Within Jamaica, nice spud pudding is upon a lot of eating place treat selections or is definitely offered at local bakeries from restaurants. Abroad, it may not be as easy to order cut connected with nice spud pudding, however it is pretty simple yet comprehensive a recipe and make a vintage Jamaican pudding. Several urban centers in the US, UNITED KINGDOM as well as Europe have got Jamaican or West Indian native grocery stores which share the constituents needed to create a conventional Jamaican pudding. Therefore if you feel the hankering to obtain a taste associated with Jamaica, venture out, obtain the ingredients, and start baking. Peel off, wash and also chop potato in to little dé and using food blender, blend upon “grate” choice until potato is almost smooth. On the other hand, it is possible to grate the particular potato To obtain the coconut dairy, it is possible to grate the particular coconut, include drinking water, and also squash your coconut milk that is formed. On the other hand, you should use processed or perhaps reconstituted coconut dairy Then when the yard job is done, mix all the dried out components, after which add coconut whole milk, vanilla, alcohol as well as grated spud and blend properly Blend in raisins and dump in to greased pan and also dot having bits of the particular rechausser Cook at 375 certifications Farrenheit for around one hour till arranged as well as mixture lifting begins to be able to shrink away from aspect of the pan. Greeting from over the sea. detailed article I will return for more.